The Rolex Explorer combines precision, robustness, and reliability making it the ideal watch choice for explorers. Famously, the Explorer was worn on the first ever Everest summit by the Sherpa guide of the renowned mountaineer Edmund Hillary. Dating back to 1953, the Explorer is designed to withstand the toughest of expeditions and it includes the necessary features to do just that. Luminescent markings and a chromalight display enables visibility in the dark. A self-winding mechanical movement means low maintenance, freeing explorers to focus on the mission at hand. Rolex’s own high-performance alloy, Oystersteel is not only extremely resistant but highly polishable, which ensures it maintains its beauty even in the harshest of environments. The Oysterlock folding clasp prevents accidental opening and the Easylink comfort extension link, allows you to increase or decrease the bracelet length by 5mm at any time. 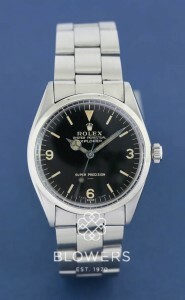 Blowers Jewellers stock a range of pre-owned Rolex Explorer watches, expertly checked and serviced to the highest standards. Browse our range of Rolex watches and buy online or in store. All watches on our website are physically available from our Kingston upon Hull Boutique, or, by appointment at our office in London’s Mayfair. 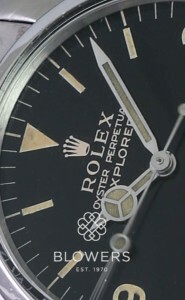 You may also be interested in Rolex Explorer II models.